Ocean City, Maryland – (October 17, 2018): FREE FAMILY FUN returns to Ocean City Maryland for the seventh annual O.C.Toberfest, October 20-21 & 27-28, 2018. Come experience all the thrills of the giant Halloween Beach Maze during its two weekend run. Children of all ages can enjoy a pleasant scream as they meander the sands of the giant, bigger and better than ever, beach maze! Wicked witches, pirates of the sand, scary scarecrows, ghouls in the graveyard, creepy clowns, zombies and more will add to the excitement. Another event that will take place as part of the O.C.Toberfest events will be the “Howl-O-Ween Pet Parade” October 20th at 1pm on the boardwalk near North Division Street. Dress up your pets and parade the boards or sit back, relax and cheer for your favorite. Lots of prizes and surprises will be awarded. While the event is free to participate, donations of pet supplies and monetary donations will be collected for the Worcester County Humane Society. They might have a few furry friends with them that you can adopt as well! 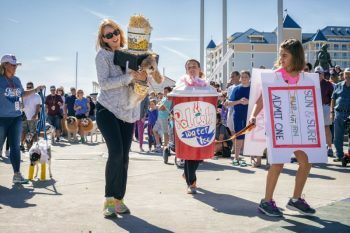 After the Pet Parade participants and spectators can sit back and watch the Drive and Disguise parade, which features cars decorated for Halloween parading down the boardwalk. The parade leaves 26th street at 3pm and goes south towards the inlet. The decorated cars will stop on the boardwalk near North Division Street for Trunk or Treating! For an added treat there will be Halloween fireworks Saturday October 20th on the beach at North Division Street. The fireworks will take place at 7pm and will feature creepy Halloween themed music. The fun continues the second weekend with “The Great Pumpkin Race” on Saturday October 27th at 1pm on the Boardwalk near North Division Street. Build your own pumpkin race car to bring and compete in this wacky and zany side-by-side downhill race. Plus there will be lots of room to watch these exciting races. Prizes will be awarded in each division as well as for creativity. If you’re ready to start building your race car visit octoberfestmd.com for complete rules. While you’re waiting for the pumpkin races to start make sure to check out the Big Toys on the Boardwalk where you can see, touch and climb on giant trucks, ATVs, Police Cruisers and more! The Big Toys will be parked from noon to 3pm around Amusement Pier. All O.C.Toberfest events are free thanks to the generous sponsorship by the Ocean City Mayor and City Council along with the Department of Tourism, Dough Roller, Francis Scott Key Family Resort, Hotel Motel Restaurant Association, Layton’s Restaurant, Pit & Pub and Seacrets. For more information on any of these events or for sponsorship opportunities please call 410-798-6304 or visit www.octoberfestmd.com.